After having one of the best bullpens in baseball last season, the New York Yankees are trying to get the band back together in 2019. The team took a big step toward that late Saturday night, agreeing to re-sign lefty Zach Britton. The deal is reportedly worth $39 million over three years. After two seasons, Britton has a chance to opt-out of the deal. If he doesn’t, the Yankees can exercise an additional fourth year on the deal for an additional $14 million. Britton came to the Yankees last summer after several successful seasons as the closer for the Baltimore Orioles. After coming to New York, Britton took on the role of set-up man. In 25 games for the Yankees the second half of the season, he posted a 2.88 ERA. Britton isn’t quite at the same level he was from 2014 to 2016 when his ERA was under 2.00. However, he remains an outstanding late-game reliever. Of course, rather than exploring opportunities to become a closer again, Britton decided to return to the Yankees as a setup man. Aroldis Chapman remains entrenched as New York’s closer. While Britton may get some save opportunities and provides the Yankees with another experienced closer in case they need one, it’s Chapman’s job. That leaves Britton to team up with Dellin Betances and several others as the bridge for the Yankees to get to Chapman in the 9th inning. The deal to bring Britton back reportedly developed rather quickly. It may be no coincidence that it happened so soon after former Yankee reliever David Robertson signed with the Phillies. With more of the top setup men on the market signing with teams, the Yankees decided not to waste any more time before solidifying the back end of their bullpen. However, the Yankees may not be done yet. They continue to be linked to Adam Ottavino. Signing him in addition to Britton is not out of the question, especially with Robertson signing elsewhere. As it stands, the Yankees will have Chapman as their closer with Britton and Betances as their primary setup men. The likes of Chad Green, Jonathan Holder, and Tomy Kahnle would also figure to hold key roles in the Yankee bullpen next season. That group should continue to give the Yankees one of the deeper bullpens in baseball. It also helps that they virtually have three different closers at the back end, including Britton, to help secure leads late in games. Ultimately, re-signing Britton was the best way for the Yankees to retain one of the best bullpens in baseball. Having that bullpen was one of the team’s biggest weapons during the 2018 season. They will aim to have a similar edge in 2019 and beyond. 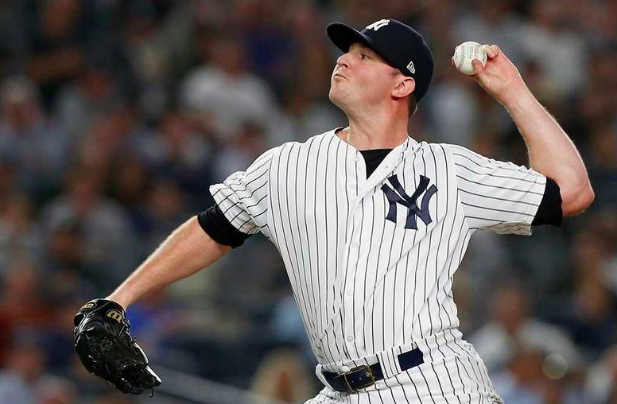 While there is still room for one more, having Britton back on board will help guarantee that the Yankees have the same kind of dominant bullpen that they covet.